In our case we used it in a range of varying scenarios across internal functions as well as for external clients. It is fairly well featured and suited for use across multiple use cases. Albeit we ended up not using the pay features because it was an occasional requirement for us, I think one of the areas where it would be well suited would be processes requiring online payments based on variable logic. The pricing structure ironically makes it less suited for the same scenario for users with limited requirements. Intouch Insights is great for companies needing to a deeper look at their customer base without the need to pay for a consultant to do it. Intouch does enable you to reach people on all platforms (desktop, mobile, tablet) and lets you create a decent experience too. If you're a small marketing team, make sure you allow the appropriate time span to set up and use the software as it can eat into time. Compatible with most smartphones: Our forms can be viewed and used on almost every smartphone. Some outliers may be phones that are not up-to-date on software. Variety: We can make an array of form types enabling us to really update our mobile experience. We also have a good selection of question types to use to build out engaging forms rather than stale ones. Simple to use: The builder interface is really simple to use. You can drag your questions to shake up the order, add images if needed, and you can even provide a question description to give users more detail. Data can be "collected" offline: If the person uses the form offline, it's supposed to sync with our software after they come online. We've found that it doesn't always sync well and we have to use incomplete data or trash the form fill as a whole. Set up is a little challenging: We had to work with a customer rep along with reading the help forum to get this set up the way we wanted it to be, causing us to use up time we didn't originally allot to it. Issue alerts: While it does work most of the time, we have had a few hiccups with the issue alert functionality. We would actually find the issue or be informed of the issue before the software alerted us. 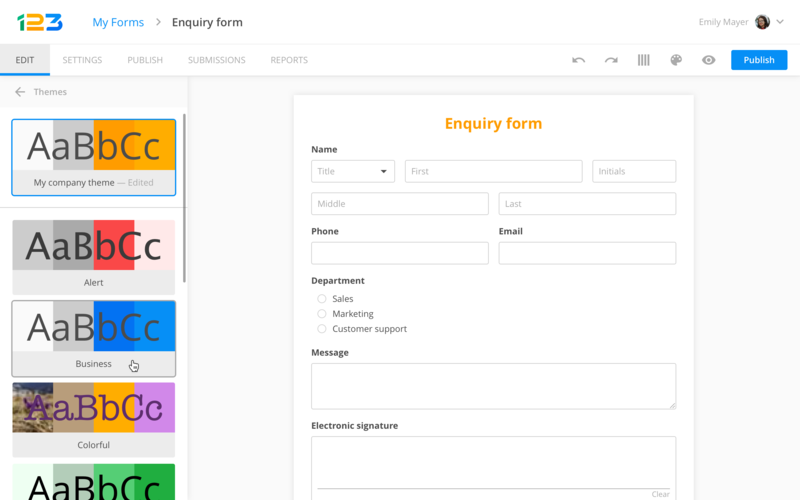 I have used several contact form plugins for WordPress, they are superior to 123ContactForm in that they provide more CRM options, but in terms of ease of installation and ease of use 123ContactForm is a better option for non-development website builders, or site owners that might not be as tech-savy. Compared to InTouch, these three look like amateurs. They are far too simple and do not have the mobile capability and mobile display appearance as InTouch. While they are cheaper alternatives, you'd be losing out on a lot of key benefits, especially with analytics, that InTouch delivers to its users. Positive: More reliable answers in a neater presentation. Positive: Creation of more forms without adding more time, leading to more insights. Positive: Reduction in cost on materials (paper, pens, etc) which equals the cost of the software.